Space. The Final Frontier. Of Good Times. Reminder: Elite, Star Citizen and EVE Valkyrie aren't the only promising space shooters in development. 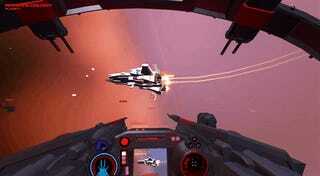 There's an underdog pinging away on the fringes of the scene, and that underdog is Enemy Starfighter. It may not have the money or features that the bigger games do, but it does have style, and also a welcome focus on immediacy, its simplistic (and, yes, wonderfully Homeworld-ish) visuals complemented by immersive stuff like the breathing sounds from a helmet and the shaky-cam effects of a moving cockpit. Course, it now also has something a little more immediate, as the game is going to be playable at PAX with Oculus Rift support. I played an earlier build of the game in May and loved it. This new trailer shows stuff like the game's deeper strategic elements and bigger battles (which weren't ready in the build I got my hands on) are coming together.